In this collaborative post, six fellow boomer travel bloggers join me in expounding upon the special joys of off-season travel. The notion of visiting destinations “off-season” is appealing to many over-50 travelers. No longer bound by rigid school and work schedules, these travelers can take advantage of all the benefits of the slow season. We’re often asked when is the best time to visit Aix en Provence. Our reply? “ANY time!” This elegant “Paris of the South” is truly a delight in any season, but if you prefer less-crowded lanes, more room to browse in the market squares, and lower travel costs, then winter is the time for you. It may even be sunny enough to sip an aperitif on a terrace, watching the world go by on Cours Mirabeau, but if not there are lots of cozy indoor spots for a drink or a meal. We have our winter favorites as well as our warmer-weather favorites. We’re heading back next month – who knows, maybe we’ll get to see a dusting of snow again! Read more about visiting Aix en Provence in winter. We’ve been to Italy several times but always during the hottest months of the summer when we were fighting our way through crowds to see the Vatican and Siena’s Duomo. Even small towns were filled to the brim with people. This year we decided to head over in winter; what a difference a season makes. We found ourselves alone spending an hour in Orvieto’s Cathedral and even wandered the streets of hill towns without seeing another person. Italy in winter is where it’s at, no crowds, lower flight costs and the food is always amazing. Read more about visiting Italy in winter. There are the usual reasons to visit Prague in winter: lack of crowded tourist venues, ease and flexibility of accommodations, restaurant reservations not as necessary. But we believe Prague in winter is a fine thing to do if you really want to know the city. The vibe may well be similar in summer, but we’re betting not. And then there’s the milky quality of Prague’s winter light, Vermeer-like. You’re transported back in time to the milieu of Kafka and Dvorak. Perhaps you’ll layer in Kundera’s Unbearable Lightness of Being, the teachings of Jan Hus or the legend of Wenceslas. Prague in winter is moody and indistinct, open and closed, its walls thick to ward off the cold, and warm and welcoming inside. Read more about visiting Prague in winter. I don’t think Santa Fe has an “off season.” Every season has unique things to offer. The official “season” is from around Memorial Day through mid-October, and then again over the Christmas holidays but my favorite time is early May. The chance for snow is just about zero and if it does snow, it melts by mid-morning. Daytime temperatures tend to be in the 70s during the day, but dip into the 40s and 50s at night. Things are in bloom and it’s just about perfect. Santa Fe’s high desert landscapes have inspired artists for over a century. The City Different offers world-class galleries, museums and great shopping in independent boutiques. It’s a great walking city and for those that enjoy the great outdoors, there’s hiking, skiing, rafting and even hot air ballooning. Diverse dining options include traditional Northern New Mexican and world cuisine as well as farm to table fusion. We live here because we love it four seasons of the year. Read more about Santa Fe in spring. Recently we faced the prospect of spending a bleak European winter on a motorbike. After much discussion we decided, instead, to settle in La Barossa, a beachside suburb of Chiclana just south of Cadiz in the South of Spain. It turned out to be a great choice because during the month we spent there, we had only a few days of rain. The majority of the time was spent enjoying the warm winters days averaging between 18-20c. Along the beach, there were lots of restaurants and tapas bars where we could drink and enjoy tapas watching the sun settle over the Atlantic Ocean. It was also close enough to explore the surrounding cities of Cadiz, Jerez, Conil, Vejer, Algeciras, Tarifa and Gibraltar by public transport. Overall, it was a great place to both chill and explore. It’s quite amazing that La Barossa remains one of Spain’s best kept secret winter destinations. Read more about La Barossa in winter. Meteora, Greece is such a spectacular place but really the best time to visit is in the shoulder season when the hordes of tourists are gone from the main town and the many scenic spots of the national park. When you want perfect landscape pictures and stunning vistas of the area without all the tourists, visiting during the off-season is a must. I was there in November and had most of the trails to myself, which was such a wonderful way to experience this truly amazing UNESCO World Heritage site. We re-discovered the joys of off-season travel last month when we visited the Napa Valley during Cabernet Season, which lasts from November through April. The weather wasn’t idyllic but it was far better than what we had left at home in New York. The positives far outweighed any negatives: There were fewer tourists making our stay feel more authentic; there was less traffic on busy Route 29 making it easier to get around; and it was easier to make restaurant and hotel reservations. Another added benefit: There were off-season packages (many listed on the Visit Napa Valley website) that offered seasonal discounts on food, lodging, travel and attractions. 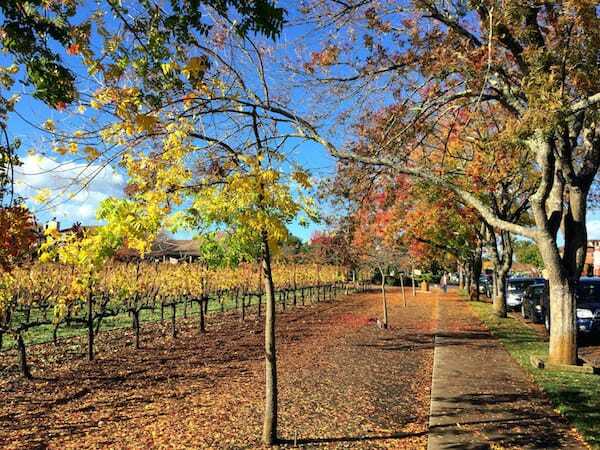 Read more about visiting Napa Valley in winter. Have you visited a destination that had special charms during the off-season? We went to Disney World the 1st week of February. As far as Disney goes, it was pretty quiet with much shorter lines and the temps were 60/70s, nice for walking around all day. Also, easy to get reservations at the restaurants. I can’t stand crowds so it was great! That’s a great one to add to the list! Great round-up! I enjoyed reading about all these great destinations! All fantastic places to explore in the down season, I think I have been to a few of these at the right time. Some of these places were on our radar and some weren’t. I’m a big fan of off-season travel as I don’t like crowds. By the way- thanks for including my suggestion of Santa Fe. Thanks for sharing your insider’s point of view, Billie! A lot of great off season suggestions here. Thanks for putting this list together. Some inspiring choices here! We’re headed to Italy in May and hope it will be off season enough to avoid at least the biggest crush of crowds. Sounds a little like the storm chasers on TV….too close for comfort, I think! We once vacationed at Hilton Head in-season and I spent most of the trip glued to the Weather Channel when a hurricane threatened. That was not fun. At the time, there was only one evacuation road. I totally agree that if it is the local experience that you want, there’s no substitute for going when the tourists don’t. Not sure that’s entirely possible in some places like Italy, but if you can’t even SEE what’s in the Vatican, what’s the point of going? Good list of off-season destinations. Off-season travel can be a great way to see and experience a place without the crowds. I agree…particularly if the weather holds up! Great inspiration for off-season travel! One of the definite advantages of being in the boomer category. We have visited southern Spain several times in the off season, and the horror stories about crowds simply don’t apply. Some restaurants close up during slow periods but there are still enough places open and they are filled with more locals than tourists. Even in January the weather is nice enough to eat outdoors and relax on the beach. Then Spain makes the off-season list! I too like to avoid crowds and prefer off season travel. I have learned though that for me October is very iffy for much of Europe because I don’t like rain and have been in a lot of it! I think June is the nicest month on Marco Island, Florida where I live. The snowbirds are gone, it isn’t horribly hot and everything is still open. Lower prices for off season travel are another reason I’m a fan! All fantastic locations! Thank you for putting this together. I loved it. What a talented group! Glad you liked it, Suzanne! Try Tucson in May to see the cactus blooms that those travelling during season (October to April) often miss! Thanks for the hint about Tucson! Seems to overlap with off-season in Napa. We are believers in off season travel. So much better to avoid the crowds, and usually get a better deal too. I am looking forward to re-visiting some favorite places in the offseason soon. My kids are graduating high school this year and we will have that flexibility to travel off peak. Yes, an empty-nest gives you more flexibility in choosing when you travel! I have been to London and Prague both during the off season, as well as other parts of Europe. Also been to Asia during the the off season which isn’t bad except the off season is usually typhoon season. Very Good Idea to travel on the off season, Not too busy too crowds for Restaurant Hotel. I Love it, sure I will travel on Off season for my next trip. I’m glad this post could offer some thoughts about your next trip. I find the last week in May and the last week in August perfect for trips in the U.S. The weather is decent, attractions are open for the season, but the kids are in school, so there is less family travel. Sometimes, August can be tough in the U.S. Many families want to take advantage of the last weeks of travel. I think schools open in the South in August but not in the Northeast. I was in Venice one February and totally appreciated its emptiness then, too. Great post and so many of these destinations are on my list. We try to schedule visits to popular tourist places during the off or shoulder season, too so that we don’t have to fight with the crowds or wait in long lines. Since we travel full-time we try to venture into the more out-of-the-way places during the high season to avoid the higher costs as well as masses of people. Yes, you can head just about anywhere in off-season and get better prices and less crowds. Except, when going south of the equator, remember that our winter is their summer. We visited Meteora in the “shoulder” season of September and had to deal with elbowing massive crowds of people, all trying to squeeze into the monasteries. It wasn’t a very pleasant experience. So for Noel to visit this amazing sight in November (and enjoy it much to himself) must have been special – we’re jealous! Your comment points out how timing can make such a difference in a tourist’s experience of a locale. Great post! Totally agree, we would rather see the sights in the off season. We have been to Prague in July and only spent one day there before we hightailed it off into the small towns and and cities where we really enjoyed our time. We just spent a week in Mexico’s Copper Canyon and felt like we had the place to ourselves, we loved it, even though it was a tad chilly at night! I so enjoyed reading about these many fascinating places, and thank you for the opportunity to share about Aix as well. I’m so appreciative of your contribution, Anne. Hope to visit Aix sometime soon! Great overview! We love Greece in the off-season when the pace is slower, the beaches empty, tour buses fewer and prices definitely cheaper!! I will be in Orvieto this summer i guess it is not the best time or the year but it is the only time I got for traveling. Any suggestions? Great list of off-season travel! It sounds a great way to experience that city without the hustle and bustle of tourists! Where’s the best place to visit in January (looking for inexpensive and warm). So hard to answer not knowing where you are living and coming from! You need to consider the transportation cost of getting to your destination as well as the cost of your stay. There are many all-inclusives in the Caribbean and Mexico where you can know your costs upfront without constantly putting your hand in your pocket.